Reeeeeeeeeee69/Josephstalin69/Loltakethistipnoob is proliferative deckbuilder and long-time S ranker. When he's not changing his name or tipping tryhard noobs, he can be found testing underused cards as techs for popular archetypes. Through branches now the wind sings. Feel the power of living things. Ziran’s BBS naturally lends itself to heal builds, making her the general of choice for what may be the most cancerous archetype on ladder. What has been missed, however, is its power to make favorable trades. Golems have always been the gold standard for stats on curve, hamstrung only by their lack of tempo-positive effects. Ziran changes this, taking advantage of their already powerful stats to shore up traditional weaknesses to plasma storm while in turn bolstering their longevity to near timelessness. Add in tempo-positive synergies in the form of warblade, boulder breacher, and draining wave as well as a global finisher in divine liturgy, and you have all the tools to bring ladder to its knees. your standard golem core with added omph in the form of hailstone and brightmoss golem, enabling you to curve out larger threats for slower games while retaining the ability to develop and buff multiple smaller bodies in a turn. Silverguard Knight and Ironcliffe Guardian are powerful minions in their own right, but also bolster the efficiency of their golem breathren. Silverguard is an amazing warblade target, while Ironcliffe naturally capitalizes on the ramp provided by celebrant. Use them to lock down the board in anticipation for a liturgy or immolation play, as well as protecting smaller golems for synergy combos in subsequent turns. Bar immolation, all the deck’s removal is cheap, enabling opening turns to be played as close to on curve as possible. This facet is particularly true against Ragnora and Reva. Watch your health total when playing multiple draining waves, but generally most aggro will fold to your provokes if you can establish board early. Immolation and boulder breacher are powerful ways to both bolster your board while deleting theirs. Do NOT forgo developing better bodies in favor of these during the early turns if possible, as a the formers net more value the better your board is. While boasting a heavy top end, this deck can play many cards if it has too. As such, it can run both jammer and oath with impunity. Always consider match up when deciding to play jammer, as you can play a slower game should your opponent run a faster deck. Divine liturgy is frightening in its own right, and far superior to bond for the purposes of this deck. It takes a bit of practice to learn when to hold it and when to cycle it in favor of tempo. The card punishes tempo negative plays from your opponent. Consider holding it versus trial decks like xor and wanderer, as an on-curve xor or wanderer often spells your enemy’s doom by your unanswered board. This is by no means a top tier deck, its lack of ping and healing rendering it particularly vulnerable to solo and artifact based builds. In addition, the deck struggles with playing from behind. The key to mastering this deck is to recognize its two lines of play: building multiple bodies for warblade buffs, or curving out brightmoss and ironcliffe to overwhelm a smaller curve. 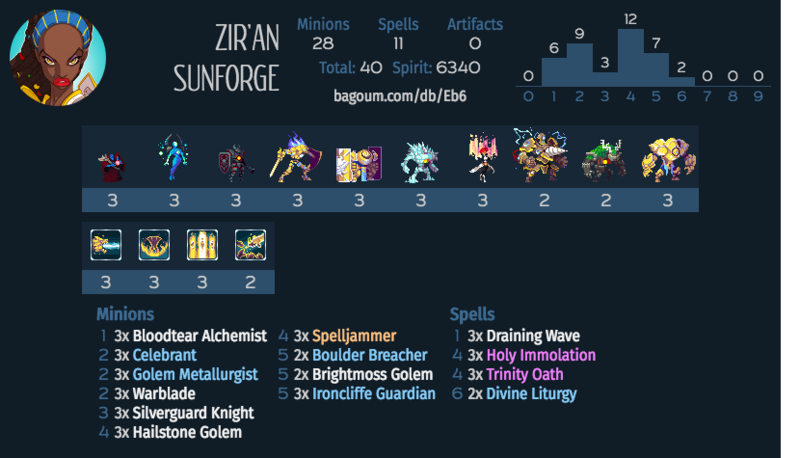 Generally, the former is better against vetruvian and swarm builds, while the latter is better against aggro. This deck is cheap, accessible, as well as quite fun and refreshingly honest to play. It rejects the solitary, trial, and removal-based metas and turns duelyst back into the game it was meant to be: a position-dependent tactical board game complete with fierce minion vs. minion combat. Deck is probably more diamond than S-worthy, but there is no reason why you cannot pilot it to high S with practice. Mastery of this deck demands mastery of positioning fundamentals reminiscent of older metas, and the skills you net will not be wasted. A combo based swarm Lyonar deck that attempts to establish a high-health board of low cost minions and then finish the game by buffing them with a Liturgy.